Pádraig is the author of Burkes Biking Blog. This week he loves latté and cycling in early Autumn. He loves dahlias, begonias and Marion too, but not Strava segments that finish 10 metres beyond a junction. With the evening light restricted members were out in force for the weekend activities. On the road from Cappoquin it was a 50/50 split for straight home or the black hill to Colligan. A super day to be out on the bike with 90k covered at 28kph. Four G4 riders set out on a dry & bright Sunday morning. Numbers depleted due to a few late cry offs and one doing the spin on Saturday as the early forecast for Sunday was not good. Thankfully it was wrong and the 4 enthusiastic riders began the climb up Colligan. Onwards towards Half Way and onto Cappagh cross heading for Lismore with very pleasant perfume wafting in the wind to overcome the slightly pungent smells of the countryside. A refuel stop at the garage in Lismore in glorious sunshine meeting and greeting other cyclists from Youghal and Cork swapping banter and in some cases shoes!!! 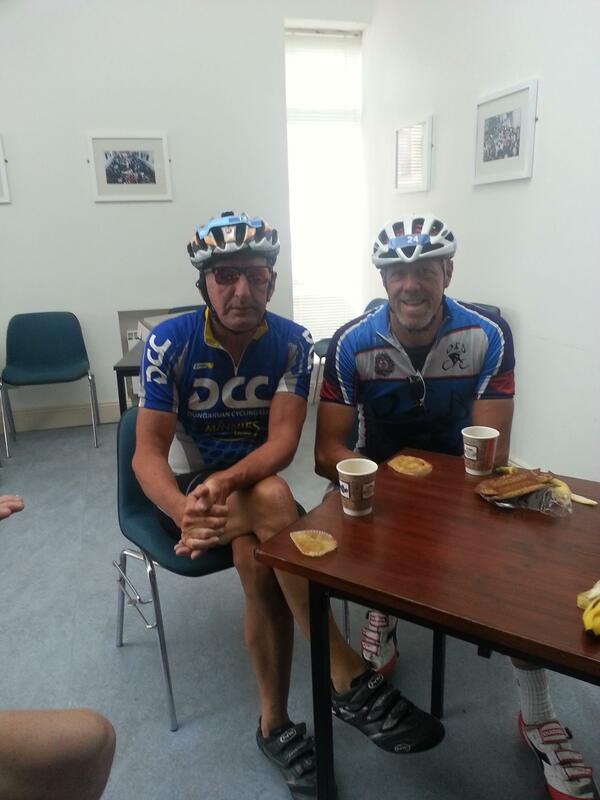 Padraig (that’s me) from G3 on extended coffee break joined us for the spin home. Back on the bikes up the hill in Lismore turning left for Deerpark with one who didn’t study the route heading for Tallow. All was well as he realised he was on a solo run! All straightforward to Cappoquin, Military road, Ballinroad and home. A great spin just over 80Km. Páraig is the author of Burkes Biking Blog. This week he loves latté and cycling in early Autumn. He loves dahlias, begonias and Marion too, but not Strava segments that finish 10 metres beyond a junction. Sometimes a day on the bike pans out better than any plan. Today was one of those days. Cloudy and cool 12C; light easterly wind. Today was one of those days when plans work out differently. Differently, yet better. 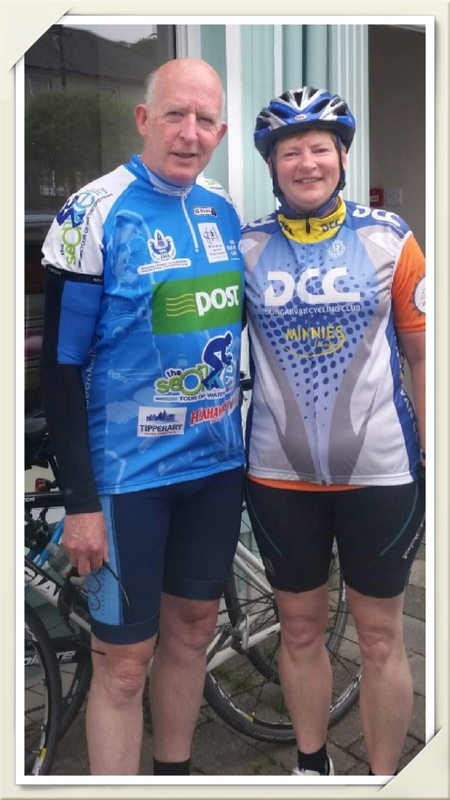 Intending to meet up with the Thursday 9am Kilrush gang before a second spin with Marion and Anne, I was surprised to find myself alone. On my todd. No-one else there. 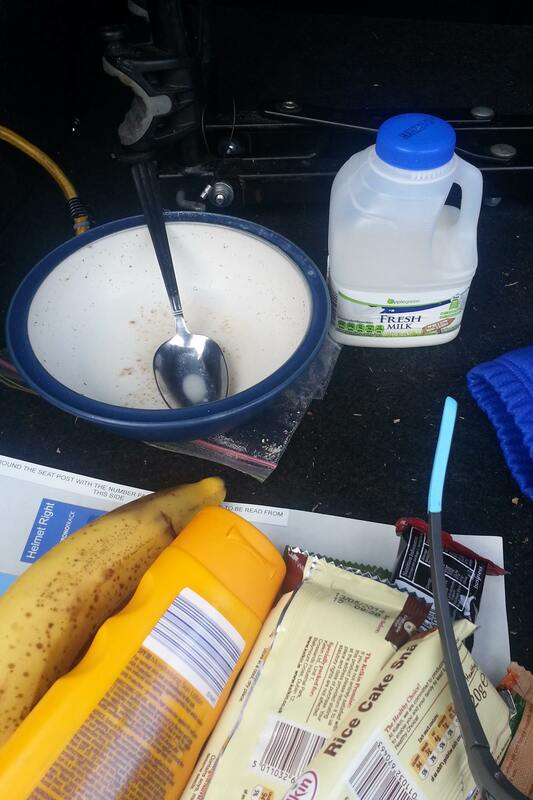 Time for plan B, a solo trip to Cappoquin and be back home in time for elevenses. This plan B changed several times along the way. With a reasonable tailwind towards Ballylemon, I cranked up the pace. 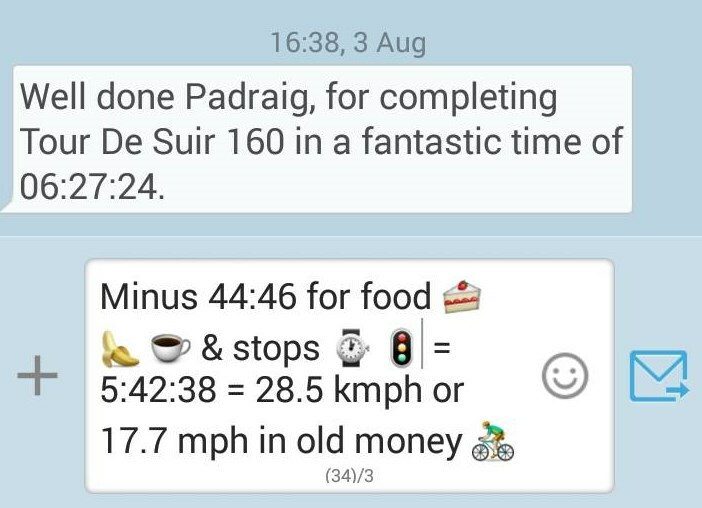 By Cappagh, I was fully warmed up and going well. Pushing a bit harder to Affane, I watched the Garmin pace nudge past 31k, and finished the hard workout at Richmond House. Then the easy fun bit began. Rather than return the same route, I went by Glenshelane back to Affane, and from there I hit on a Plan C to explore roads unseen for quite a while. Passing Affane Church and derelict old schoolhouse, I meandered on towards Joe White’s at Kilmolash, and uphill on the back road to Villierstown. 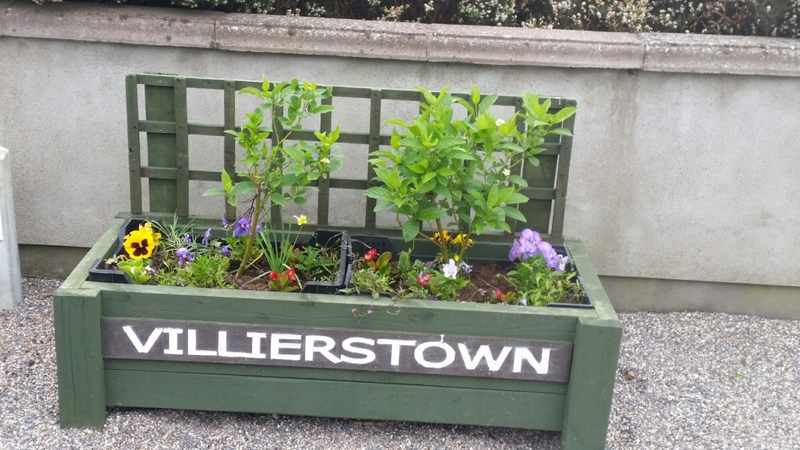 Villierstown was looking great in the sunshine. A quick diversion to the Blackwater for a few photos and a sit-down, was followed by further byroad meandering to Aglish. I realised by this time that I would likely be a small bit late to meet the ladies back in Abbeyside. Time therefore to push on a bit as I returned by my old school in Ballinameela, arriving just after 11 for coffee. 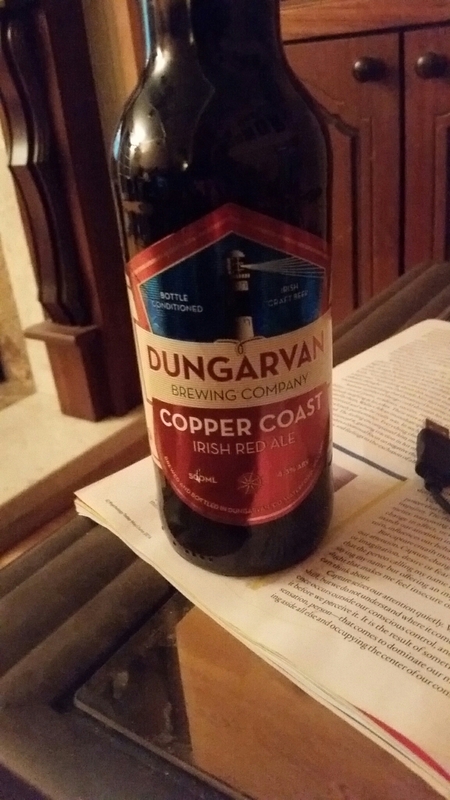 Part two saw us heading once again to Cappoquin, but this time along the back road to Kilmolash, at a wonderfully social pace. 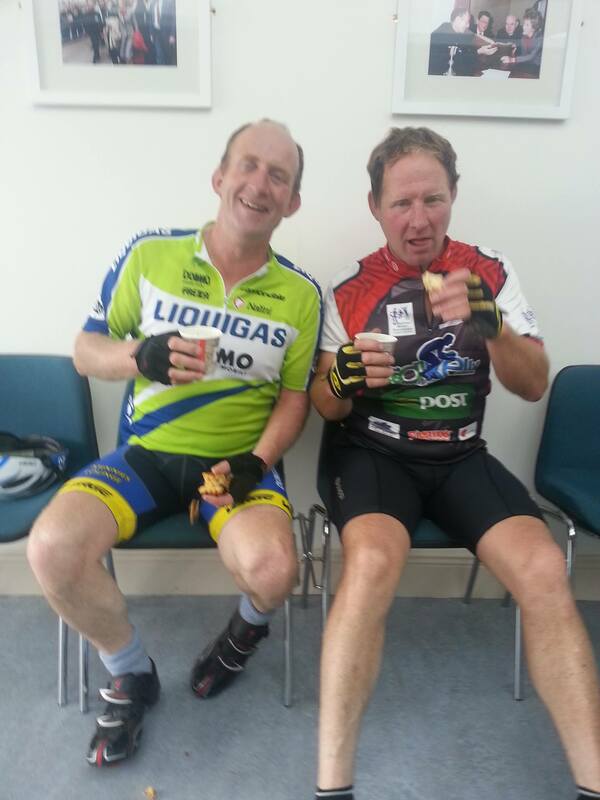 Coffee at Barron’s was very welcome and we devised a Plan D to return to Dungarvan on the Modeligo Motorway, via Glenshelane once again. 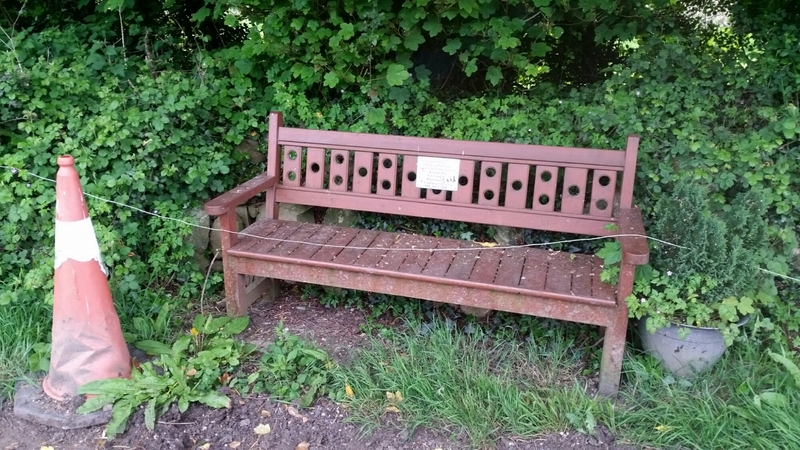 One of the sights along the social ramble was a beautiful wooden seat at Knockalara. I have passed it lots of times, but today was the day to stop. It was put in place by the local residents. 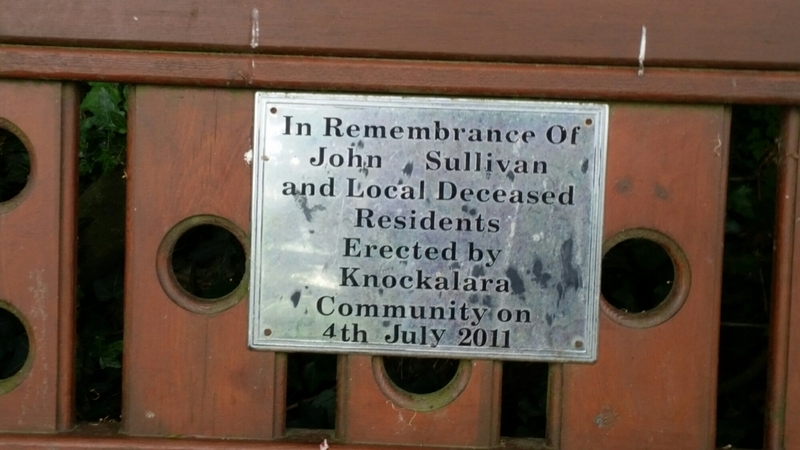 in memory of one John Sullivan. What a great way to remember him, and other deceased neighbours! Summary: 104 kilometres (65 miles) including 30 minutes hard workout, followed by over 3.5 hours easy biking with plenty time for photos, chat and coffee (or two).